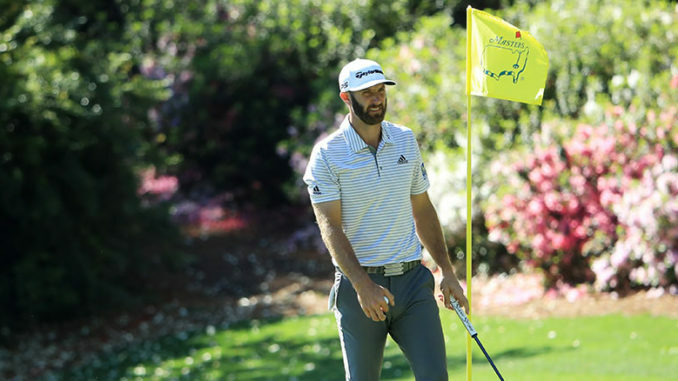 Golf’s first major tournament of the year returns to storied Augusta National Golf Club in Augusta, Ga., for the Masters Tournament. Patrick Reed won the green jacket in 2018. ESPN airs the first and second rounds on Thursday and Friday. The third and final rounds air Saturday and Sunday on CBS. Episode 3 of Jordan Peele’s sci-fi update stars Sanaa Lathan as a mom whose excitement at driving her son to college turns into trepidation when she begins to have odd visions that feel like moments of déjà vu. Where is she traveling? All together now: the Twilight Zone! This prequel series set in the universe of Syfy’s recently canceled Z Nation introduces all-new characters. Jamie King stars as a mother torn from her daughter who embarks on a harrowing journey to find her during the dark, early days of a zombie apocalypse. ESPN2 airs both games of the NCAA Division I Men’s Hockey Championship Frozen Four from KeyBank Center in Buffalo, N.Y. The championship game is Saturday night on ESPN2. NBC Sports Group’s comprehensive coverage of the 2019 Stanley Cup Playoffs continues tonight with three Game 1 matchups across NBCSN and USA Network. Tonight’s doubleheader on NBCSN has Auston Matthews and the Toronto Maple Leafs opening their series against Brad Marchand and the rival Boston Bruins, followed by Nathan MacKinnon and the Colorado Avalanche visiting Johnny Gaudreau and the Calgary Flames. On USA Network, Alex Ovechkin and the defending Stanley Cup champion Washington Capitals open their playoff series against Sebastian Aho and the Carolina Hurricanes. Amelia (Caterina Scorsone) and Link (Chris Carmack) travel to New York to operate on a patient with a severe spinal deformity, but they’re in for more than they bargained for when Nancy Shepherd (guest star Embeth Davidtz) invites them to dinner at her home. Jack’s (Glenn Howerton) war with his neighbor reaches a turning point when it threatens to ruin a date with Lynette (Elizabeth Alderfer). And when the school photographer ups his rate, Durbin (Patton Oswalt) takes school pictures into his own hands. By tracking down new leads and using new DNA tests, this documentary special takes a deeper dive to ultimately help bring justice and peace to the family of JonBenét Ramsey, a child beauty queen who was killed in her home in 1996. Featuring an exclusive interview with her father, John Ramsey, and revealing the last known photo of JonBenét, the documentary also pursues numerous “intruder theories” of the crime. After Murphy’s (Perry Mattfeld) latest one-night stand calls her “Mommy,” she develops a rather unexpected lead in Tyson’s (Thamela Mpumlwana) case: Tyson’s mother. Her lead provides rather daunting results, so she tracks down Tyson’s cousin Darnell (Keston John) and encounters his “business associate,” Max (Casey Deidrick), who is immediately smitten with her. Traditionally, couples exchange paper gifts on their first anniversary. Tonight, however, detectives Jake Peralta and Amy Santiago (Andy Samberg and Melissa Fumero) end up celebrating a year of married — not to mention harried — bliss in a hospital room, guarding a comatose perp. Will the freshman comedy finally give engaged Clem (Nina Dobrev) her perfect life? Only if she and fiancé Nick (Tone Bell) can score their marriage license in time. Leonard (Regé-Jean Page) takes on one of the country’s best and most prolific litigators in a case that leads him to grapple with his personal feelings related to race and privilege in America. Back at the public defender’s office, Jay (Wesam Keesh) takes on his first drug case, but things heat up when he has to work with a rather unconventional lawyer. Benson (Mariska Hargitay) works to uncover a pregnant teenager’s secret when she refuses to name the baby’s father. Jim Parsons is an executive producer on this semiautobiographical comedy series based on Ryan O’Connell’s book I’m Special: And Other Lies We Tell Ourselves. O’Connell stars in and is also an EP on the series, which is loosely inspired by his own upbringing and experiences as a gay man navigating the world with cerebral palsy. Today, a pre-Mad Men Jon Hamm makes his first of five appearances on getTV’s reruns of this 2006-09 CBS special-ops drama. He’s an unshaven academic and fervent antiwar protestor whose outspokenness rubs philandering army wife Tiffy Gerhardt (Abby Brammell) the wrong and right way. ESPN airs the second round of the Masters Tournament from Augusta National Golf Club in Augusta, Ga.
Just as the Huangs are settling into life without Eddie (Hudson Yang), an international incident catapults him not only to Taiwanese fame but also right back to America. In order to fix Eddie’s mess, the family gets a new “daughter” — but when things go awry, Jessica (Constance Wu) must add a new word to her vocabulary. In the new episode “Friends + Enemies + Border,” MacGyver (Lucas Till) and Desi (Levy Tran) help a group of Syrian refugees who are being pursued by human traffickers. Bill Nye reprises his role as Patterson’s (Ashley Johnson) father in a case that pits the team against a pestiferous foe. Zapata (Audrey Esparza) goes rogue with an old friend as Jane (Jaimie Alexander) and Weller (Sullivan Stapleton) continue their search for the hooded figure. Maya (Minnie Driver) braces for JJ’s (Micah Fowler) high school graduation and departure for college, but tough news from NYU changes everything. Dylan (Kyla Kenedy) teaches Jimmy (John Ross Bowie) a “dad lesson” as he gets ready for a big job interview, and Kenneth (Cedric Yarbrough) pressures JJ to prepare for a grand finale to their time together. In the new episode “He Kama Na Ka Pueo (Offspring of an Owl),” Five-0 investigates the murder of a man whose body may hold the key to a 20-year-old case involving a kidnapped girl whose father never stopped looking for her. Liz (Megan Boone) and Ressler (Diego Klattenhoff) investigate a Blacklister who offers to erase gambling debts — at a deceptively high price. Meanwhile, Dembe (Hisham Tawfiq) grows concerned as Red (James Spader) tests the loyalties of their business associates in search of the individual who turned him in to the police. Bakers in Texas create an unbearably cool cake that has an element of surprise, and a knight in shining armor becomes a cake fit for medieval royalty. Next, a bar mitzvah cake is filled with the celebrant’s favorite things, and an edible pinball cake lights up and is ready to be played! The NBA playoffs begin as 16 teams enter the long grind to the NBA Finals. ESPN and ABC combine to televise four conference quarterfinal games today. CBS airs live afternoon coverage of the Masters’ third round from Augusta National Golf Club in Augusta, Ga. The Colorado Rockies are at the San Francisco Giants and the N.Y. Mets are at the Atlanta Braves for FS1’s Saturday MLB doubleheader. Richmond Raceway in Virginia hosts Kyle Busch, Joey Logano, Kevin Harvick, Denny Hamlin, Martin Truex Jr., Kyle Larson and other Monster Energy NASCAR Cup Series stars for the Toyota Owners 400 primetime race on FOX. In a moment of impulsivity, Abbey (Bethany Joy Lenz) pours out her feelings in an anonymous letter that she seals inside a bottle and tosses into Boston Harbor. Months later, the bottle is discovered by Nick (Andrew Walker), the son of Abbey’s boss. As Abbey and Nick begin an anonymous email courtship, their real-world relationship gets off to a rough start when they are assigned to work together on a project, not knowing their irritating partner is the same person they’ve been romancing online. This new sports documentary shares enigmatic NBA superstar DeMarcus Cousins’ roller-coaster ride through free agency that culminated in a shocking one-year deal with the Golden State Warriors, and chronicles his private and emotionally charged journey back from a devastating Achilles injury. Interior design couple Nate Berkus and Jeremiah Brent return to save desperate homeowners whose “money pits” have left them overwhelmed and defeated. The stakes are even higher in Season 3 as Nate and Jeremiah are pulling out all the stops to tackle the most challenging renovations to date. The Favourite’s Emma Stone returns to Studio 8H for her fourth appearance as host. This time she’s joined by South Korean musical guest BTS, a.k.a. the biggest boy band since One Direction. Who will get to try on a new green jacket in Butler Cabin? Golf’s first major of the year, the Masters, concludes today at Augusta National Golf Club in Augusta, Ga.
TNT’s coverage of the NBA playoffs begins with a Sunday triple-header of conference-quarterfinal games. NL East foes clash on ESPN’s Sunday Night Baseball as the N.Y. Mets visit the Atlanta Braves at SunTrust Park. Original MTV VJs Mark Goodman and Alan Hunter host tonight’s episode, which not only includes a sit-down interview with metal mastermind Sebastian Bach, but also interviews with some of the most iconic actors of the 1980s. FOX News Channel presents a special Town Hall America With Harris Faulkner on Sunday in Urbandale, Iowa, as part of the network’s special 2020 election coverage. Moderated by Outnumbered Overtime anchor Harris Faulkner, the town hall will be presented in front of a studio audience and focus on what voters care about most ahead of the upcoming election. Throughout the evening, Faulkner will highlight discussions with everyday Iowans on hot-button political issues, in addition to featuring interviews with representatives from the Democratic and Republican parties, including Iowa Senator Joni Ernst (R). Topics to be discussed will include the impact of the #MeToo movement on the 2020 election, the Democratic Party and the rise of socialism. Villanelle (Jodie Comer), needing to lie low while she recovers, finds a good Samaritan to take her in and care for her in the new episode “Nice and Neat.” Meanwhile, Eve (Sandra Oh) finds out a secret that Carolyn (Fiona Shaw) has been hiding from her. Kandi clues Porsha in to what the streets were saying regarding the timeline of her and Dennis’ relationship. NeNe is joined by husband Gregg and the two get candid about his cancer diagnosis and their marriage. Marlo and Tanya join the ladies and they all rehash the drama of their Destin and Tokyo trips. Tempers flare when the ladies discuss the infamous “Bye Wig” party. In the Season 1 finale episode “Que Será Será,” Miles (Brandon Micheal Hall), Cara (Violett Beane) and Rakesh (Suraj Sharma) finally come face to face with the elusive Henry Chase (guest star Derek Luke). In round one of The Cut, the acts face the deepest and most intense cut of the season with judges Jennifer Lopez, Derek Hough and Ne-Yo. The top six acts from each division remain, but only the top three highest-scoring acts from each division will move on to the Divisional Final and be one step closer to winning a grand prize of $1 million. This week, Derek Hough mentors the Upper Division, and special guest Jenna Dewan returns to mentor the Junior Team Division. At the clinic, the Turners oversee a measles vaccination trial while the team prepares for the Whitsun bank holiday. Valerie helps a struggling mother accept her son’s birth defect. The season’s epic competition between Buddy Valastro and Duff Goldman comes to a climax with the final, space-themed challenge in Philadelphia, where the judges will crown the winner and end the greatest feud in baking history. In the first of three all-new films premiering this month starring Holly Robinson Peete, chef/restaurateur/morning show host/sleuth Billie Blessings (Peete) finds romance blossoming with police detective Ian Jackson (Rick Fox) while they try to prove that one of Billie’s former restaurant servers isn’t dishing up murder. It’s been over a year-and-a-half wait, but tonight marks the beginning of the end of HBO’s juggernaut. 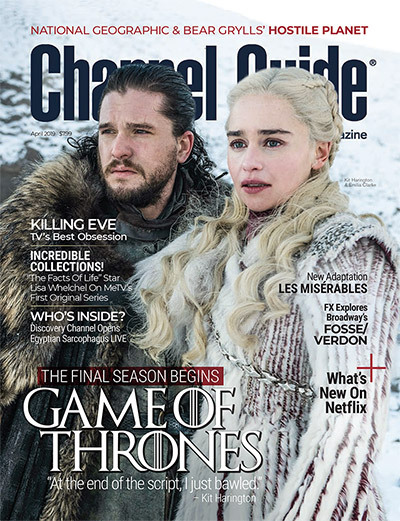 The final eighth season will run for six episodes. Dominic West plays Jean Valjean, the most famous fugitive in literature, alongside David Oyelowo as Valjean’s obsessively relentless pursuer, Javert, in this gritty and dramatic (and nonmusical) six-part adaptation of Victor Hugo’s classic 1862 novel. The incredible cast also includes Lily Collins, Ellie Bamber, Olivia Colman, David Bradley and Derek Jacobi in a story that spans from the 1815 Battle of Waterloo to the 1832 Paris Uprising as it tells of Valjean’s efforts toward redemption and Javert’s constant efforts to bring him to justice. Jane Pauley guest-stars as herself in the new episode “Carrying the Gold,” in which Elizabeth (Téa Leoni) must deal with fallout from a news article alleging she had an affair with President Dalton (Keith Carradine) during her CIA days. Four professional bakers compete for a chance to have one of their unique creations produced and sold online by the Cake Boss. In Round 1, these talented bakers whip up desserts that show who they are as bakers to earn a seat at the table with Buddy Valastro. Next, they present the one item they think will help them hit the big time. Finally, the remaining two bakers put all their love and energy into their big-money item in the intimidating production facility at Carlo’s Bakery. Collector Deb Hoffmann has been recognized by the Guinness World Records for the largest collection of Winnie the Pooh items. Her nearly 18,000 pieces of Pooh memorabilia are spread across two houses, and include a Winnie the Pooh costume from the Walt Disney World theme park and a limited-edition Winnie the Pooh telephone. When Lisa Whelchel and appraiser Judy Martin visit and assess the collection, Martin brings along a very special surprise. When Rio (Manny Montana) gives her an assignment, Beth (Christina Hendricks) is forced to take her kids with her. Meanwhile, under pressure from Turner (James Lesure), Ruby (Retta) crosses a line from which there’s no coming back. Annie (Mae Whitman) meets her new manager at Fine & Frugal. Melissa Joan Hart and Sean Astin star in this dramedy about 13-year-old Nicole, a.k.a. “Nick” (Siena Agudong), who infiltrates a family with the intent of getting revenge on them for unknowingly ruining her life. As she gets to know the family, however, she finds compassion for them and begins to wrestle with whether or not she can go through with her plan. Devon (Manish Dayal) grows concerned when a mother’s complaints go unaddressed after her delivery, and pushes Bell (Bruce Greenwood) to take drastic measures. And as Jessie’s (Julianna Guill) condition worsens, Conrad (Matt Czuchry) faces breaking the news to Nic (Emily VanCamp). Mary Magdalene is among Jesus’ best-known female followers, and she witnesses the torment of his crucifixion at the foot of the cross. But her faith is rewarded the most when she is the first to witness the seemingly unbelievable: Jesus’ resurrection. A simple fisherman, Peter was Jesus’ most devoted disciple, his “rock.” But when a frightened Peter disavows Jesus three times during Jesus’ arrest, Peter despairs. The resurrected Jesus appears to Peter and restores him by commanding him to spread his gospel, and Peter takes on that mission. The artists take the stage in front of coaches Kelly Clarkson, Adam Levine, Blake Shelton and John Legend to compete for the chance to advance in the competition. The results of tonight’s Cross Battles airs tomorrow night, when the artists learn if they will be moving forward in the competition. Benedict Arnold has been labeled as America’s worst traitor for nearly 250 years, but why did the patriot war hero turn to treason? In the season finale, “Mrs. Benedict Arnold,” discoveries reveal that the spymaster behind Benedict Arnold may have been his teenage wife, Peggy, due in part to her close relationship with a British spy chief. In the new episode “We Don’t Need Another Hero,” Adam (Matt LeBlanc) gets jealous when he finds out he’s not his son’s (Matthew McCann) hero. Captains John Abraham (Luke Mitchell) and Maya Dobbins (Anna Wood) head to a war zone when they are assigned to opposite sides of the courtroom in the case of Marine charged with abandoning his post during combat. When the 9-1-1 system is hit with a system-wide power outage, the call center goes old school to respond to emergencies. The wildernesses are among the most volatile environments on Earth, where animals must endure an ever-shifting journey through freeze, fire, flood and drought. In the new episode “Grasslands,” watch as bull elephants clash in mating battles, North American bison endure a blizzard with a pack of wolves in pursuit, and cheetahs stalk gazelles in the Kenyan savanna. The district attorney’s office makes everyone take a lie detector test in an effort to find the mole feeding information to Ezra Wolf (Scott Cohen). Meanwhile, Maya (Robin Tunney) receives an unexpected visit at work from Sevvy’s (Adewale Akinnuoye-Agbaje) son Gabe (Alex Saxon). Host Michael McKean has two tickets to paradise and is inviting everyone for a taste of the good life! He’s finding out how poke started cooking without gas, why the Mai Tai became tied to tiki bars and if Hawaiian pizza is from the great white north. A mysterious knight arrives at Chartres Temple and brings the Knights Templar devastating news. Louis (Tom Forbes) struggles to produce an heir, creating a rift between him and his wife. King Philip (Ed Stoppard) sends Gawain (Pádraic Delaney) on a mission where he comes face-to-face with his former Templar brothers. Flashbacks to the past reveal the fateful events that led CIA Deputy Director Erica Shepherd (Jennifer Carpenter) to betray her country and the ensuing investigation that put her on a collision course with Will Keaton (Morris Chestnut).